This Sunday’s annual Cartier Queen’s Cup was a who’s who of the worlds of fashion, film and society, with polo aficionados joining the Queen and Duke of Edinburgh at Windsor Great Park to enjoy a thoroughly British day out. 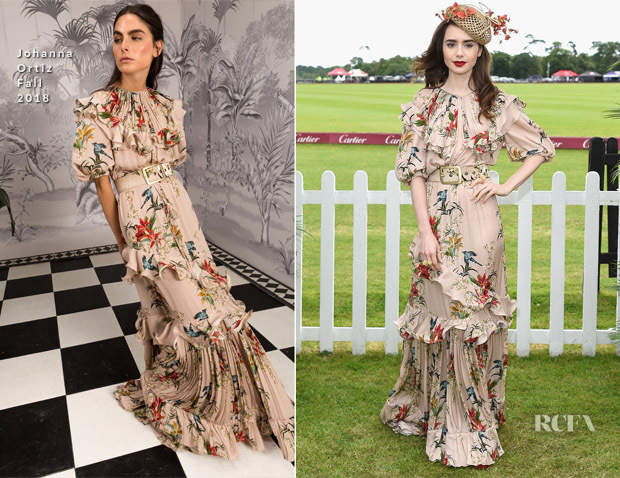 Guildford-born Lily Collins was looking every inch the English Rose, despite wearing a dress with plenty of Latin flavour from Johanna Ortiz’s Fall 2018 collection. Fluted ruffles – a signature of the brand – and a key-hole cut-out made this a statement-making summer style. 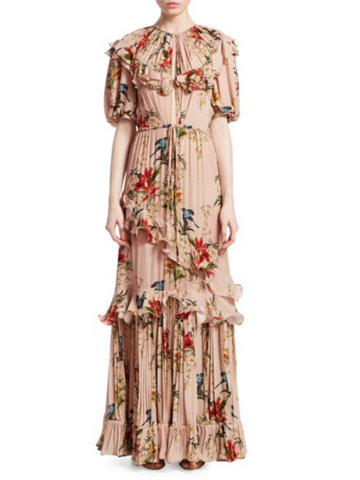 Rendered in an eye-catching bird and floral print the look fuses effortless femininity with a sense of playfulness. With her signature bold red lip and Stephen Jones Millinery fascinator, the actress wouldn’t have looked out of place at last month’s royal wedding.